Melania Trump And The 'Daily Mail' Settle Libel Lawsuits : The Two-Way The Mail will pay a reported $2.9 million, far less than the $150 million the first lady had sought. The lawsuits concerned an article that made false claims about her time as a model. First lady Melania Trump arrives in West Palm Beach, Fla., last week. On Wednesday, she reached a deal to settle defamation claims over an article published in the Daily Mail tabloid about her time as a model. 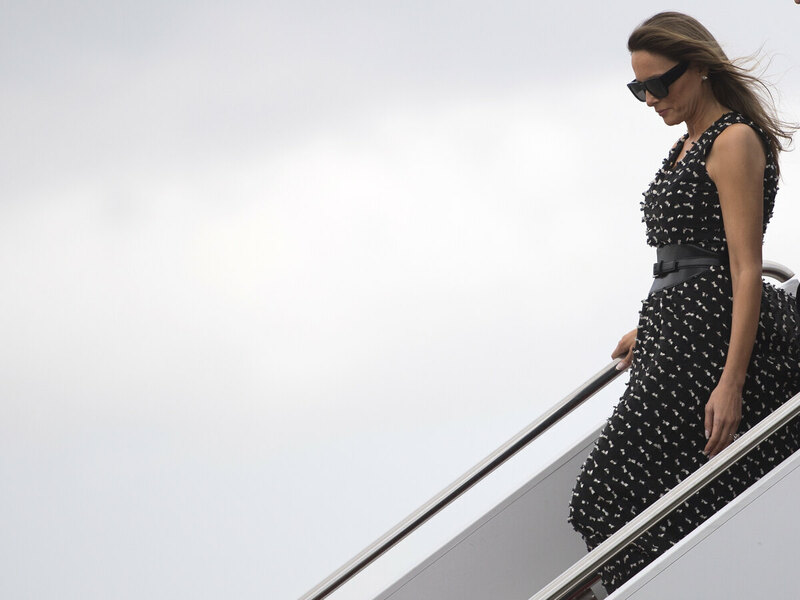 The Daily Mail has agreed to pay damages and issue an apology to first lady Melania Trump to settle defamation claims over the British tabloid's insinuations that she "provided services beyond simply modelling." The basis for the lawsuits in the U.S. and the U.K. was the Mail's report about Melania's time as a model, published online and in a two-page article last summer under the headline, "Racy photos and troubling questions about his wife's past that could derail Trump." "The allegations strike at the heart of the claimant's personal integrity and dignity. The claimant has not acted as alleged. The suggestion that such allegations even merit investigation is deeply offensive and has caused a great deal of upset to the claimant." We accept that these allegations about Mrs Trump are not true and we retract and withdraw them. We apologise to Mrs Trump for any distress that our publication caused her. To settle Mrs Trump's two lawsuits against us, we have agreed to pay her damages and costs." The terms of the settlement were not released in court. The Associated Press reports that the total for the U.S. and U.K. lawsuits is $2.9 million. "Plaintiff had the the unique, once-in-a-lifetime opportunity, as an extremely famous and well-known person, as well as a former professional model and brand spokesperson, and successful businesswoman, to launch a broad-based commercial brand in multiple product categories, each of which could have garnered multi-million dollar business relationships for a multi-year term during which Plaintiff is one of the most photographed women in the world. These product categories would have included, among other things, apparel, accessories, shoes, jewelry, cosmetics, hair care, skin care and fragrance."